To provide products and services evolved through the deployment of current technology, cost effective and time tested process and optimum utilization of resources. Products are checked at each stage of production - from procurement of materials to pre-delivery of the finished item. To meet customer requirements by supplying consistent Quality products on time, every time through continual improvement and total employee involvement. To be considered synonymous to original equipments across the world. Our organization comprises of fully qualified work force in their respective fields, having wide and diverse experience in the field of engineering and manufacturing and total commitment to quality, who fully utilize the available infrastructure to bring out the best to our clients. Founded on a commitment to have continual growth and development in an ever-changing market scenario, its objective is to provide highest order quality all through in business, loyalty, trust, professionalism and expertise combined with the ability and determination to foster long-term relation ship are the hallmarks of the company. Reethika Precision Engineering believes that people, infrastructure, process and knowledge act as a cohesive force in establishing an organization that is built to last. Machining Cam profiles, back boring and tapping operations in HSS material and also machining intricate profiles in Ferrous and Non-Ferrous materials. We have state of the art new technology machines for Precision Turning and Milling upto 4 axis contours plus Grinding facilities. 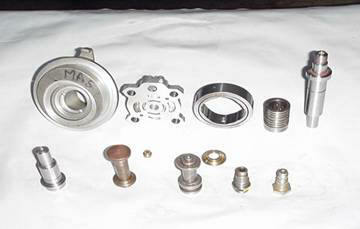 We support fully pre machining of raw materials using conventional machines for large amount of material removal. Recently, we included Vibro-Deburring machine for deburring and finishing operation for high precision components. 3. Standadyne Amalgamation Pvt. Ltd.